I have some fun 18th century sewing plans coming up, which I shall describe in EXTREME detail in a future post (due to doing a ton of Research). That means it is finally time I make an actual shift, instead of continuing to wear a tank top under my 18th century clothing. I plan to hand sew the whole thing. I went with Sharon Burnston’s amazing instructions for cutting and constructing a shift. Free pattern, free research, free info, what’s not to love? Of course, nothing can ever be that simple. 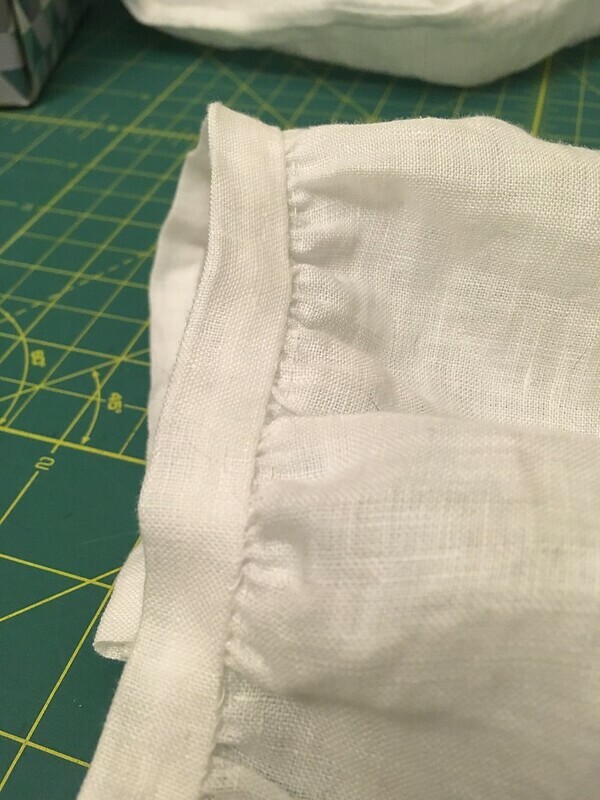 First my fabric – I had gotten some linen on sale from Farmhouse Fabrics years ago. Since Farmhouse Fabrics is generally $$$ and high quality, I assumed this linen would be too. It took absolutely forever to pull threads to get my pattern pieces. I couldn’t get the thread to pull for more than 4 inches or so before it would break, so that was super tedious. Ok, finally got the pattern cut out. 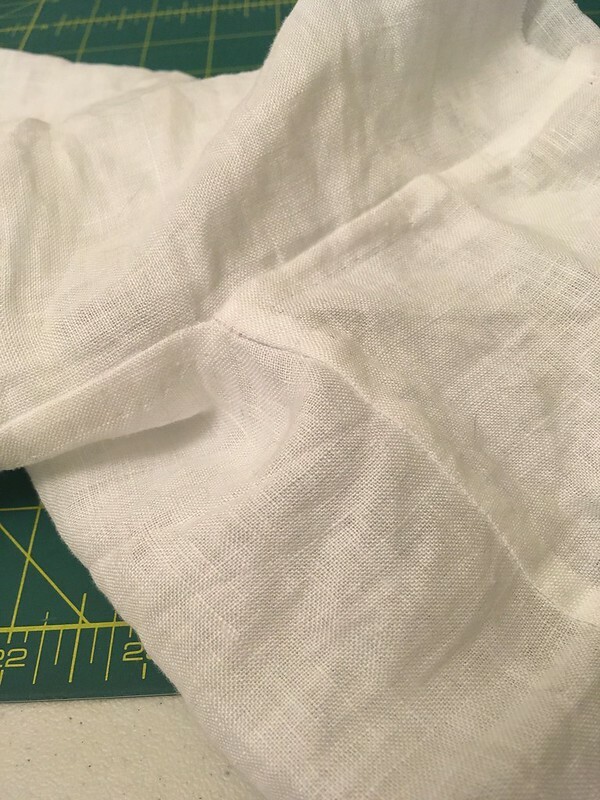 I did make some changes to the neckline – I know that I always have issues with patterns falling off my shoulders, so I narrowed the neck on the sides and front by a good inch before cutting. Then I tried the body fabric on with just the neckhole cut out with my stays. I ended up lowering the front several inches in order to hit that just-barely-appropriate level right above the top of my stays. I do highly recommend trying on the shift body with stays before cutting out the neckline fully and hemming it. You can fix a too-small neckline, but too big is not really a fixable problem. And then things got more gnarly. According to the pattern, the fabric for the arm should be a 17″ by 17″ square. I sewed up both sleeves, and did all the stroke gathers and attached the cuff on one. (Can I say here how much I detest stroke gathers? I get they are just super tiny cartridge pleats which I enjoy, but the small scale is a massive pain. Especially with linen which is not super tightly woven, so I was actually trying to count threads to get even narrow gathers). At this point, I stuck the sleeve on my arm just for fun. And the cuff was nearly at my wrist. I pinned the sleeve onto the shift just to make sure. This sleeve is supposed to hit just past the elbow, not all the way to the wrist. 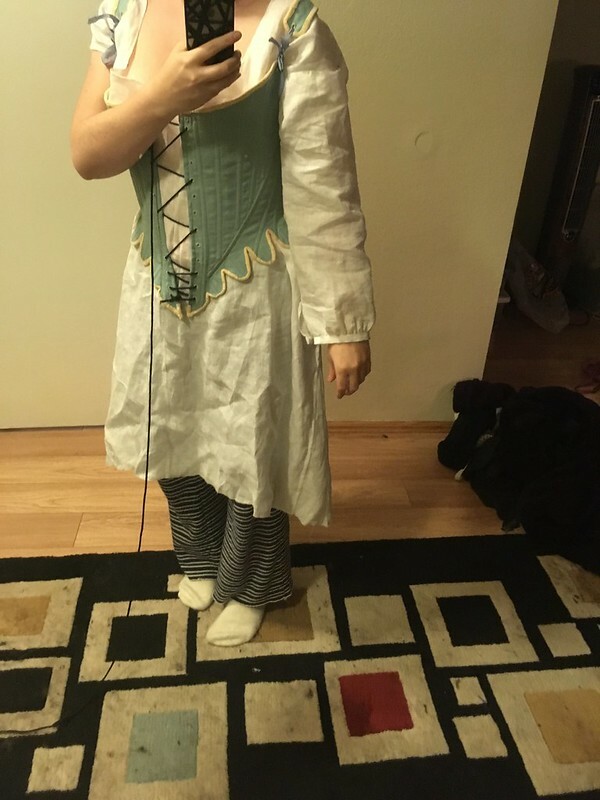 I was also concerned that it would be too full to fit under the 1780s gown sleeve I had planned (although it would have been perfect for 1750s or so). So, I gritted my teeth, and undid these beautiful stroke gathers and flat fell underarm gores in order cut down each sleeve. I ended up taking 3″ off each end of the sleeve to make it a 14×14″ square. I also took another 2″ off the shoulders on the shift body, angling down to nothing where the original gore had been cut out. I honestly don’t understand how this measured so incorrectly. Like yes, I am short, but I doubt my arm is a full elbow-to-wrist length shorter than the average woman’s elbow, and Sharon made her pattern based on averaging out a bunch of extant shifts. This entry was posted in 1700s, 18th c shift, Undergarments. Bookmark the permalink. Oh… I feel you! I have the same problem with necklines falling off my shoulders. Just yesterday I got a few nasty pin scratches while figuring out a “shoulder friendly” strap placement for a 1920s shift. That seems to be exactly the issue! Well, I just took 4″ off my straps which should be super tight now but nah, still slipping a bit. Oh those lovely stroked gathers! Isn’t that just the most soul sucking thing, ripping out beautiful stitches? Lovely work. I look forward to seeing it finished.